It was very annoying when I work on rhel 7 and screen gets locked when it was idle for some period and again I have to logged in from virtual box and then on server. I search on web to turn off screen lock on rhel 7 and it was hard to find out. rhel 7 have different options to turn off screen than in previous versions. So I thought to create this post so that people can easily turn off their screen lock without wasting their time searching for it. 1. Open the rhel 7 GUI. 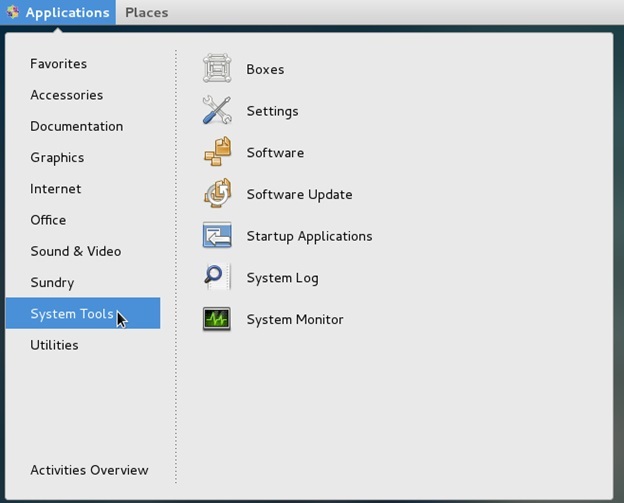 In Applications go to System Tools. Modification of boot time (grub timeout) is little different in rhel 7. Grub timeout is time to wait for manual selection of boot entry loaded by GRUB boot loader. This is useful for maintenance boot or to edit/modify boot entry In rhel 7 default grub timeout is 5 second. In rhel 7 /boot/grub directory is not present nor /boot/grub/menu.list. In rhel 7 grub is modified with grub2 and we can use /etc/default/grub file to modify boot loader configuration. It’s not recommended to modify any grub file in rhel 7 apart from /etc/default/grub. Following are the default values from /etc/default/grub file.